Unripened green bananas don’t have much taste (just a faint nuttiness), and they don’t have any sugar or gluten. What they do have is an awful lot of dietary fibre – around 60% by weight – and resistant starch, a prebiotic that also helps maintain digestive regularity. Green bananas feature in a variety of ethnic cuisines, but this flour from Ceres Organics is another great way of adding them to your diet. It’s made from Certified Organic Ceylon bananas which are dried and then milled into a powder you can use in any recipe that calls for wheat flour. (Just replace each cup of wheat flour with ¾ cup of banana flour.) 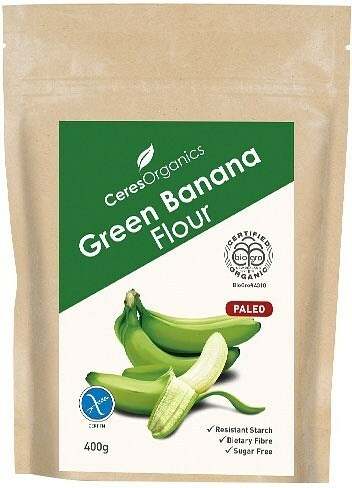 This green banana flour is also an easily-blended source of fibre when you’re making smoothies.